The How To Train Your Dragon series has been quite a ride, filled with quality storytelling, humour and heart, breathtaking animation and gorgeous music. It caps off the trilogy with The Hidden World, a rollicking third chapter and conclusion to this legend that sees Hiccup (Jay Baruchel) and his beloved companion Toothless searching for a new home to migrate to, a kingdom beyond the end of the world where dragons originally came from and a place he heard in tales from his father (Gerard Butler in brief flashbacks). Out to stop them is dragon hunting guru Grimmel, played by a sassy F. Murray Abraham who has just about as much fun with his voiceover role as he could without actually physically being there. Grimmel wants to eradicate all Night Furys from the world, and it’s a race against time, the elements and the reliable stupidity of Hiccup’s endearing childhood buddies to seek out this new home. Hiccup is a fantastic hero because he started out as anything but that, a sensitive, bullied youngster who grew into the strong leader he is today but is still full of self doubt and has never lost his softer side, people like him always make the best leaders. Cate Blanchett is around again as his mom, but sort of takes a spectator’s seat to her son and his rapscallions, including wife to be Astrid (America Ferrera). The real magic here is the relationship between Toothless and a newfound love, a beautiful white female Night Fury who flirts, plays heard to get and frolics with him all across the oceans and skies in a display of animation that’s hard to believe, especially when they reach the fabled Hidden World that looks like something out of Avatar. These films share a wonderful message of love towards the animal kingdom, teaching that if you show trust, admiration and kindness to these creatures, the lives of both species can be enriched. I love the symbiosis between humans and dragons in this series, the variety and personality of each different breed and the pure imagination employed in bringing such designs to life. Highly recommended. ParaNorman is a film that’s just about as close to perfect as you can get. Released by a low profile studio called Laika that specializes in gorgeously crafted stop motion animation adventures, this one has the irresistible flavour of retro Universal Studios monster movies put to use in a smart, engaging story full of well written characters, maturely imparted themes and wonderful pathos. Young Norman (Kodi Smit McPhee) can see, hear and converse with ghosts, and that generally makes him a bit of an outsider in his town. When the spirit of a deceased relative warns him of some vague impending doom encroaching on the region, it’s up to him and his merry gang including best buddy Neil (Tucker Albrizzi) his ditzy sister (Anna Kendrick), and Neil’s hilarious jock brother (Casey Affleck) to solve the spooky mystery of a centuries old witch who has risen the dead. It’s a brilliantly told story with boundless animation, a sharp script full of subtle, off the cuff humour, heartrending sadness at the core of its narrative and some of the most dazzling animation this side of Burton/Selick. The voice cast is peppered with carefully chosen talent like Jeff Garlin, Bernard Hill, John Goodman, Christopher Mintz Plasse, Leslie Mann, Elaine Stritch, Alex Borstein and more. Jodelle Ferland voices Aggie the witch as a tragic character with the same haunted complexity she brought to the role of Alessa in Silent Hill. Laika studios is also responsible for gems like Coraline, The Boxtrolls, Corpse Bride and last years Kubo & The Two Strings, they are a brilliant bunch who are trailblazing storytelling in exciting new ways. ParaNorman has to be my favourite though, it’s an enthusiastic love letter to golden age horror and an emotionally mature study of what it means to be different, how people react and the damage that can be done simply by not accepting someone for who they are. Trust an animated film to inject themes like that and explore them thoroughly while still having a blast of a fun time. I can’t say enough good things about this film. How To Train Your Dragon 2 takes what made the first adventure so special and blasts it even further into the stratosphere of animated thrills and creature comforts, all set to one of the finest scores I’ve heard in recent years, in a cartoon or otherwise. Sometimes sequels forget the ‘less is more’ adage and pile on way too much in order to outdo their predecessor, but this one gets the formula, adding in all the right places while keeping the core of the story alive. There’s also impressive and eye boggling new dragons, which let’s face it, are the reason we show up to these movies anyway. 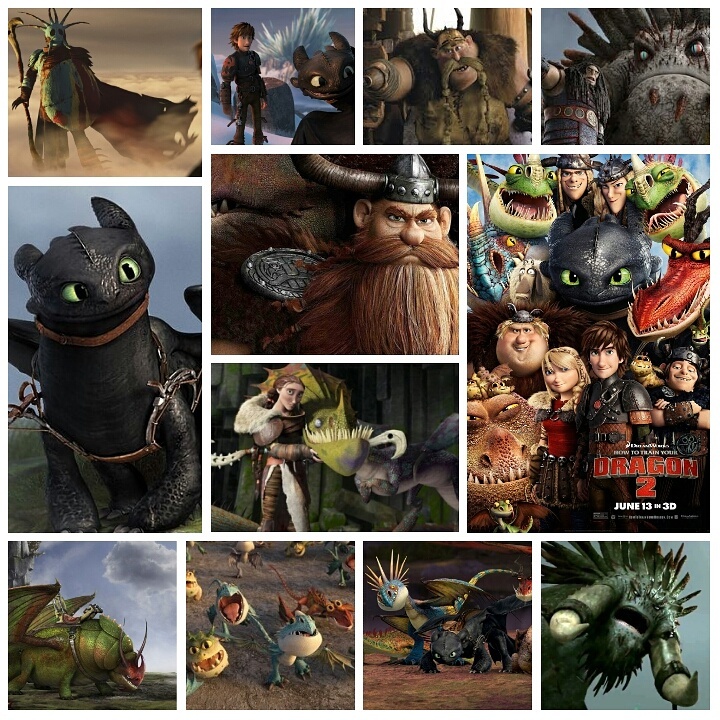 We rejoin again with Hiccup (wiry Jay Baruchel) after he has tamed the gorgeous night fury dragon Toothless, earned the respect of his grouchy father Stoick (Gerard Butler) and proved to his entire viking settlement that dragons are useful friends when treated kindly and understood on their own terms. Life is good, but not for long, as the pair of them discover a mysterious ice cave far on the border of their lands, home to thousands of new breeds of dragons, and watched over by the Dragon Rider (Cate Blanchett), who has a connection to Hiccup’s past. They are all of them under threat by tyrannical warlord Drago (a fearsome Djimon Hounsou) who commands an army and operates out of fear, putting everything the Vikings hold dear in danger. Hiccup must rally all his friends, family and every dragon in their land to fight this menace, all captured in devastatingly beautiful CGI animation that really is a marvel in the medium. Craig Ferguson returns as crusty Gobber the stable master, as do Jonah Hill, America Ferrara, Christopher Mintz-Plasse, Kristen Wiig, T.J. Miller and newcomer Kit Harington. The best part for me was seeing Toothless again. She’s a stunning, adorable little viper of a rascal who won me over fully in the first film, and it was a joy to see her return. There’s all manner of elaboratly rendered dragons on display, and they’re fantastic no doubt, but she just has that winning charm and unique appearance, not to mention flawless efforts by animators in bringing her to life. This sequel, dare I say, tops the first in many ways, without ever overshadowing it or resorting to show-boating. It’s the perfect companion piece.